REYES: And I think the more these type of comments are out there, unfortunately for the Republican Party, Steve King is just the latest in these voices that everyone is very aware of. From [Arizona Gov.] Jan Brewer, to Mitt Romney and the self-deportation, going all the way back to [former Gov.] Pete Wilson in California. And it’s a very anti-immigrant, anti-Latino message. And that’s the GOP image problem with Latinos. I think that’s wholly unfair. And let me just go back for a second, because I think this is very important. I don’t think there is a split within the Republican Party with this. You don’t see the Republican leadership or actually, quite frankly, the rank-and-file Republicans – even that have a small percentage of Latino voters in the districts – speaking this way. I think this is a very, very small minority. TRAYNHAM: Ari, can I respond? MELBER: Well, Robert, I want to bring you on to number two. The notion that, here we see Republicans and we have a question over whether they’re practicing what Steve King preaches. I mean, that’s part of what Raul has been writing. Although the GOP-bashing on Saturday’s Disrupt was no surprise, Traynham’s guest appearance was. Eight weeks into the MSNBC weekend program’s existence, Finney has only invited three Republican guests on her show – Tea Party Express chairman Amy Kremer (June 8), GOP strategist Rich Galen (June 22), and Traynham. I have to wonder: how do Finney or Melber plan to “disrupt,” or “shake up,” the conversation when all of their guests and contributors agree with them? ARI MELBER [in response to Rep. Steve King’s (R-Iowa) comments on immigration]: Wow. Well, stupid has consequences and there are a few reasons that this freakout actually can matter. Let's turn to Raul Reyes, an attorney and NBC Latino contributor, and Robert Traynham, a former Republican official and MSNBC contributor. Gentlemen, we have worked up a couple of reasons why this matters. Of course, as you know Raul, it is not just entertainment. The guy [Rep. Steve King] has some power. And you were arguing this week that this undermines national Republicans, and is not actually as out of sync as we might think from the rhetoric. RAUL REYES: Right. That's the larger problem for the GOP. When we look at these clips, hear this crazy rhetoric, it is easy to say he [King] is an extremist, he’s a nut, he’s out there. But he is an important voice on the GOP side. He is a leading voice on immigration. It was his bill, I think it was last month, to defund President Obama's deferred action plan that all of the Republicans supported. MELBER: Right, all but six Republicans, you wrote, supported it. REYES: So everyone is in there with him. The big problem for the party is, right now, there is somewhat of a void on immigration reform in the House. And Steve King, he is filling that void with this ugly rhetoric. 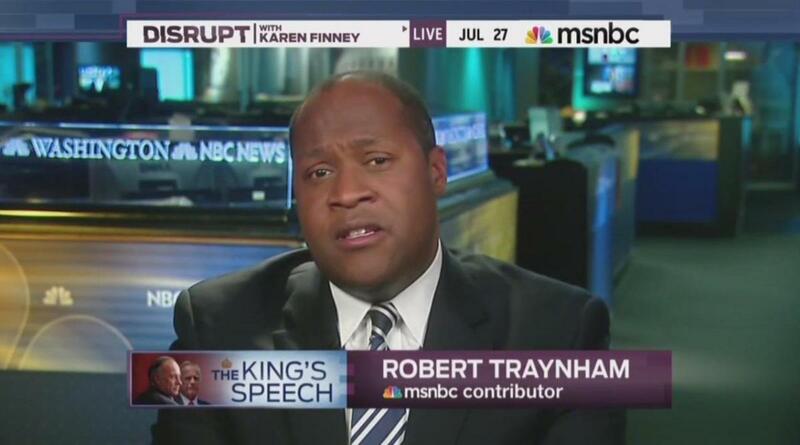 MELBER: Robert Traynham, I'm sure there are better people who could fill that void but didn't this week. I want to go to number four on our top five list. Because if it’s Disrupt, you know we're disrupting the way we do this. And getting to number four. He [King] complicates the immigration negotiations. I've heard two different lines of thought on this. Where do you come down? ROBERT TRAYNHAM: I believe he does complicate the discussions between the Republicans and Democrats. Here's why. It’s because it’s an image issue right now. If, in fact, he is saying these comments, regardless of whether you agree with it or not – and for the record, I disagree with him on this – it just sends the wrong message. It seems like the Republicans are xenophobic, it seems like they’re racist, it seems like they just simply don’t care, it seems like they don’t get the 2012 elections and they learned nothing. It really hampers the perception, but also the policy, of what Republicans are trying to do, not only with just Latinos and Hispanics but also with the big-tent strategy overall. So I think it was a horrible thing to say substantively, but also message-wise. MELBER: Well, there’s another Republican who agrees with you, in condemning the comments [from King] and on complicating the work we have to do on real immigration reform policy. Let’s take a listen. HOUSE SPEAKER JOHN BOEHNER: Our committees are doing their work. We’re going to go through this in a common sense, step-by-step way. We don’t need to make this job difficult. We’ve got a broken system. Broken legal immigration system. We have the problem of those who are here undocumented, that ought to be dealt with as well. And it does make it more difficult, but I’m going to continue to work with members who want to get to a solution – as opposed to those who want to do nothing. MELBER [laughing]: You know, I have a couple thoughts on that. One is that John Boehner almost sounds like the most reasonable when he has to respond to Congressman King. I’m not sure if that’s the way I want to get there. But you do notice that. He’s talking about reform, and the undocumented worker problem. And he sounds very realistic, at least in that sound bite. And it brings us to item number three on our Letterman top five list, Raul. And that is, that basically, we’re seeing this split on Latinos within the GOP. There we’re seeing Boehner versus King. But it goes beyond that. King represents a district in Iowa that has only about four percent Latino voters. On the other hand, there’s over 25 districts right now where one out of four voters in Republican districts is Latino, and that includes Darrell Issa’s district, Kevin McCarthy is the whip, or the Kevin Spacey character if you’re a House of Cards fan. You know, the whip’s important. What do you think about that piece of this? That this matters because there is a split. Not only obviously in the center, where Latinos are important, but within their [Republicans’] districts right now. REYES: Right, and this is a split. If you think of the GOP as the family, this is their family dysfunction playing out in public. And by the way, I just wanted to mention off the clip we saw of Congressman King – it is really astonishing that he is comparing himself to Jesus. To the Christ-like figure, and I guess standing by these comments. I thought that was astonishing. To the bigger problem for the Republican Party, think about this. For all the people who may be for whom immigration reform is not a defining issue, maybe they’re not following this debate really closely. Someone like Steve King is really drawing a very stark divide. For a lot of people, moderates, independents, it makes it pretty easy for them to decide which is the side they want to be on. And also, incidentally, in Steve King’s own district, voters there in his district, a majority of those voters favor comprehensive reform with a path to citizenship. He doesn’t even represent them. MELBER: Right, right. And that’s striking. MELBER: Well, Robert, I want to bring you on to number two. The notion that, here we see Republicans and we have a question over whether they’re practicing what Steve King preaches. I mean, that’s part of what Raul has been writing. What do you say to that criticism, or is that unfair, do you think, to the Republicans? TRAYNHAM: I think that’s wholly unfair. And let me just go back for a second, because I think this is very important. I don’t think there is a split within the Republican Party with this. You don’t see the Republican leadership or actually, quite frankly, the rank-and-file Republicans – even that have a small percentage of Latino voters in the districts – speaking this way. I think this is a very, very small minority. Representative King represents himself, obviously, and maybe his district. But this is not widespread within the Republican Party. Most Republicans realize, first and foremost, that that was a very insensitive thing [for King] to say and also to think. But also, politically speaking, they realized that the Latino vote is an extremely critical voting bloc moving forward. Especially in the southwest, i.e. Texas, Arizona, even in southern California and some other states. So, again, it just doesn’t make sense politically and also does not make sense from a moral standpoint. So I don’t think there is a split within the Republican Party on this. Not at all. MELBER: Let me get Raul’s response to that. And before we go to that, the number one reason that this thing actually matters, even if it is annoying. And that is, I think it confirms the self-perpetuating decline of the do-nothing Congress, Raul. And for people who say, why should we even pay attention to Steve King – beyond what you’ve written on his work and his advocacy – is this makes it much harder for Congress to do anything. Speak to that, and any rebuttal you want to make to Robert’s points. REYES: Right. This type of rhetoric. I do agree with him, that it doesn’t reflect the majority of the Republican Party. Certainly does not reflect Republican voters. But in the void that we have of leadership on this issue, his voice is the loudest. That’s dangerous for the GOP. And I think the more these type of comments are out there, unfortunately for the Republican Party, Steve King is just the latest in these voices that everyone is very aware of. From [Arizona Gov.] Jan Brewer, to Mitt Romney and the self-deportation, going all the way back to [former Gov.] Pete Wilson in California. And it’s a very anti-immigrant, anti-Latino message. And that’s the GOP image problem with Latinos. MELBER: Right, and that’s why you have to go even beyond the image problem and figure out, who are the new voices? Who does Boehner want to have, really next week, up on the dais with him? So it’s not just negative rebuttal, but trying to empower some other more reasonable voices. Robert, I appreciate your points – you’re trying to do some of that yourself, at least here today. And Raul Reyes, thank you for being here.